Here’s one from left field folks. 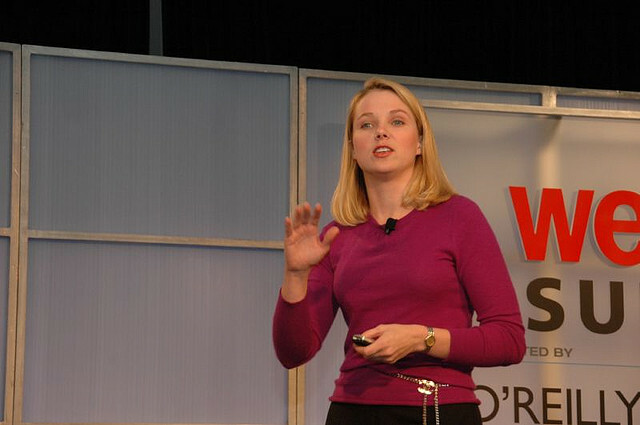 Marissa Mayer, long a face of Google and a prominent spokesperson for its location side, will depart the company to take the reigns at Yahoo, according to NYT Dealbook. The press release from Yahoo says that Mayer will start the position on Tuesday. Interestingly, Mayer may not have given notice at Google, as the Dealbook piece states that she resigned her position via a phone call today. Mayer’s history with Google has been a unique one. As employee number 20, she signed on with the company as a software engineer 13 years ago and quickly rose to the position of Product Manager before being promoted to VP of Search and User Experience. When Google shifted its methods to be more personal, Mayer was given a sideways promotion into the Location position. Mayer has, on a few occasions, made the case for machine-based information rather than the input of people. She, almost famously, made the comment of “I don’t do HTML” when addressing the UI of the Google homepage only 3 years ago. From a more reasonable perspective, Mayer’s presence for Google has been quite public since her appointment to VP. It would stand to reason that, as her profile grew, so too would her desire to move into a position of greater leadership. Mayer almost definitely felt the sting of seeing Jeff Huber promoted to the SVP level of Local and Commerce, a promotion that placed him one rung on the ladder ahead of the already-pained Mayer after she lost her position as head of the Search and UX arm. We’ve contacted both companies for a statement, and will update this piece accordingly when we get one. Googlers – Got a comment for us? Email me. Anonymity assured. In the mean time, here’s a look back at all six of Yahoo’s CEOs from 1995 to today. What’s next for Yahoo? Read on.